The test and training facility in Zofingen, Switzerland is primarily used for test, education and training purposes. The plant has a capacity of 250 kg/h of feedstock input with the ability to test different feedstock compositions in combination with various oxidizing agents. The scaffolding has been erected around the gasifier to have access to all the different sensors and equipment of the gasifier. Operators working at new BASURAgas® Universal System plants will be first trained here at this facility. It is important that operators understand the technic and the operation of the gasifier; the heart of any BASURAgas® Universal System. Here, they learn firsthand all the different parameters and settings to optimize operation and to achieve maximum efficiency. Also new technics and methods are first tested here before implemented in the field. 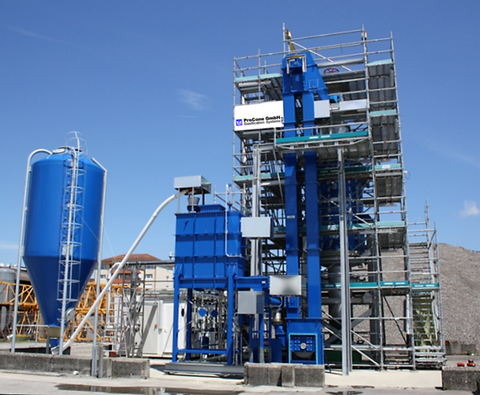 Every feedstock material used in new projects, operating the BASURAgas® Universal System will be first tested here at this facility to ensure operability and productivity. This test and training facility is also a showcase to demonstrate potential customers the simplicity and flexibility of the BASURAgas® Universal System.